A 13-year effort to bring city-sponsored public art to Petaluma is encountering a small but vocal group of detractors in the North Bay, the Santa Rosa Press Democrat first reported. Petaluma’s Public Art Committee, created in 2005, commissioned Fine Balance by San Francisco artist Brian Goggin using $150,000 in development fees earmarked for public art. 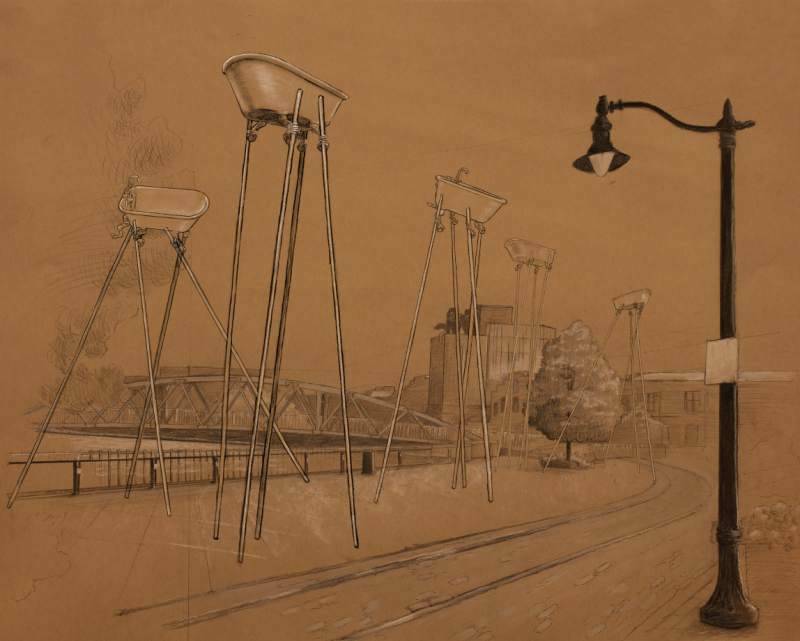 The artist envisions five bathtubs on stilts near the Petaluma River on Water Street. Goggin, a renowned sculptor profiled by KQED Arts in 2016, is known for San Francisco works including Defenestration, which involved 45 pieces of furniture crawling along the exterior of a former tenement on Sixth Street; and Caruso’s Dream, a sculptural canopy of pianos made from reclaimed factory windows and suspended above Ninth Street. At approximately 20 feet tall, Fine Balance is a similarly surreal, large-scale sculpture that the artist says references the adjacent river’s Gold Rush-era history of bathtub importing. Solar-powered LED lights will illuminate the waterfront sculptures at night. "The image of a heavy object defying gravity relates to the uniqueness of Petaluma as both a counter-cultural beacon and a traditional base," reads Goggin's description of the work. "Fine Balance refers to the agility required to navigate these times." To opposition leader Scott Andrews, however, Goggin’s proposal for Petaluma is a serious affront. Andrews, a local engineering consultant, has raised more than $3,000 on GoFundMe to oppose the artwork. The description calls Fine Balance inappropriate for the location, unrelated to Petaluma, derivative of Salvador Dalí and the stilted Walkers from Star Wars, a public health hazard, and an impediment to disabled citizens. "The people raising a ruckus, it's a small segment," said Public Art Committee member and longtime North Bay arts figure Katherine Plank, adding that it's unlikely to halt the project. "Those of us involved in the arts have been taken aback by the pushback," she continued. "At first I thought, 'Great, people care.' Now I'm not sure." In November, a "spatial representation" of the sculptures will be installed as a preview of the piece, and Plank said Fine Balance is tentatively expected to be completed by next August. "We've followed the letter of the law, and the majority of the city council said move ahead," Plank said. "There is no other vote." Andrews, whose campaign seeks $5,000, said he’s considering using the money for an “ADA-style lawsuit,” and expressed his willingness to fight the art for the next 10 years. Opponents of the artwork also include the Petaluma Valley Rotary club, which co-organizes the annual Petaluma River Craft Beer Festival on the Water Street site. Rotarians told the Press Democrat the sculpture could displace 12 of 36 vendor booths, practically ending the festival. But Plank called their concerns unfounded. "There's no way they can know that," she said. "Maybe they won't put a booth where they did in the past, but those numbers are pulled out of thin air." The Petaluma Public Art Committee issued a request for qualifications in 2014 and, in light of uninspiring applicants, another one in 2016. Goggin was chosen from a pool of 65, beating out Petaluma resident and Burning Man-associated sculptor David Best.